Central Synagogue at the corner of Lexington and 55th is the oldest synagogue in continual usage in New York City. Designed by Henry Fernbach of Germany, the design is loosely called "Moorish-Islamic Revival". 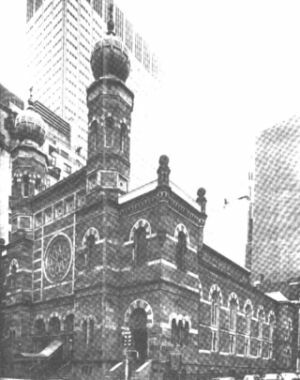 The synagogue was built by Congregation Ahawath Chesed, a German Reform congregation meeting under that name on Ludlow street from 1846. Style: Under persecution in Christian Europe, Jewish communities had been unable to develop a tradition of monumental architecture. After the emancipation of Jews in Europe, and the growth of large Jewish communities in America, it was possible to erect major worship buildings. The problem was what style to use: classical buildings called upon pagan Greco-Roman themes which many considered unsuitable for a Jewish worship space; and the Gothic style so dominant among Christians was equally unsuitable. One solution widely adopted was to make use of "Moorish" architecture - that is the architecture of Muslim Spain (or Andalusia). The relatively tolerant climate of Medieval Spain had been a golden age of Jewish culture, and it was believed that Muslim architecture had incorporated aspects of Jewish religious architecture. Thus the phenomenon of German Jewish (Ashkenazi) congregations adopting the style of Muslim Spain and the golden age of Sephardic Jewry. The first major examples of the style were Friedrich von Gartner's Munich Synagogue of 1832 and Gottfried Semper's Dreden Synagogue of 1837. The first synagogue in this style was B'nai Jeshrun in Cicinnati in 1866. Henry Fernbach, born in Germany and an immigrant to the US in 1855, could have known these buildings directly or through publications. At all events he used the style for several American synagogues. The Exterior: is dominated by two octagonal towers rising 122 feet. They are meant to be reminiscences of Solomon's Temple. The towers are topped onion-shaped, green copper domes. There is one large rose window accompanied by many smaller arched windows. The Interior: has beautifully stenciled designs of red, blue, and ochre. Cast iron columns separate the inside into three sections. There is also colorful plates published by the English designer and colorist, Owen Jones.